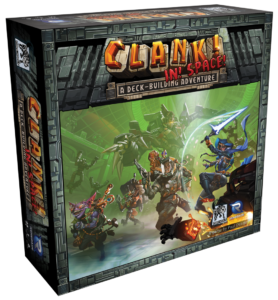 Back in December, Renegade Games launched a solo campaign for one of my favorite games, Clank! In! Space! In this preset story, our hero is a thief who must repeatedly break in to the massive battleship of Lord Eradikus, stealing his most treasured objects while making alliances and finding secrets along the way. 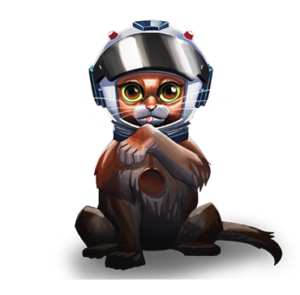 Each mission of this deckbuilding adventure has specific goals, pushing players to draft a certain style of card or gather a certain kind of treasure. At mission’s end, players are ranked based on their performance, allowing them to replay the mission later on in hopes of beating that goal. As someone who has played a good amount of Clank!, this solo app has given me an interesting insight into the game. When the game is played in its regular multiplayer mode, the game becomes more difficult as the players progress. If players are slow to purchase cards and move through the maze, the game reacts in kind, doling out damage at a slower and safer rate. If players move quickly, the game likewise ramps up to a higher difficulty. This sliding scale of difficulty gives players a self-guided buffer to their own efficiency. Let’s break this down into a decision tree based on player speed. Rather than being about maximizing my own efficiency, Clank! is really a game where I need to be aware of my opponents and just keep up. If they start making some big moves, I need to do the same thing. If I fall behind, I am suddenly in danger of losing. But as long as I play at the same level as my opponents, the game is pretty fair. Solo play throws this logic out the window. Suddenly, I’m playing against an app without mercy. Even worse, I lose my tells—there aren’t any other players to judge my own deck against! What we really need to do is determine the app’s game mechanism in order to determine how best to beat that algorithm. Dr. Whiskers is also pretty mean to our hero! Each turn, I am allowed to purchase cards from the market. Either I can buy the reserve cards, like Boldly Go and FAZR, or I can buy any of the six available premium cards in the marketplace. These premium cards are replaced at the end of the turn, and if any of the replacements have the Eradikus symbol on them, Lord Eradikus attacks and potentially damages the players. If players don’t buy cards, they don’t get hurt as often. The app, however, deletes one or two cards at the end of every turn, which means Eradikus could deal damage to you on a very regular basis. This is especially true because you are the only target of that enemy damage! The only counter to this constant barrage of damage is to take fewer turns. Which makes it ever more important that the solo player drafts cards allowing them to move around the board as quickly as possible. This requires the player to build an efficient deck. Yes, I keep using the word efficient, but what does that mean? In any deckbuilder, it means that a deck maximizes every turn. Sometimes, an efficient turn is the one where you play through so many cards that you gain an endless wealth of options. Other times, an efficient turn is simply drawing and playing the five best cards in your deck. In each of these instances, your starting cards are the least worthwhile cards in your deck! Strive for methods to banish these from your deck as soon as humanly possible. If streamlining your deck isn’t an option, look for cards that allow you to move through the maze. Multiple boot icons, small scale teleportation, and the ability to move through guard stations each grant you more efficient turns on the board. Sure, you may take damage as you move through enemies, but the game stalls when you can’t move. Stalling is always bad. In the same way, purchasing Keys from the Market give you new routes through the maze that you wouldn’t otherwise be able to take. Games mentioned: Clank!, Clank! In! Space!